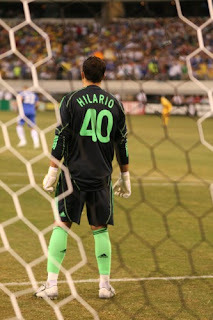 The Most Underrated Goalkeeper EVER: Henrique Hilario! 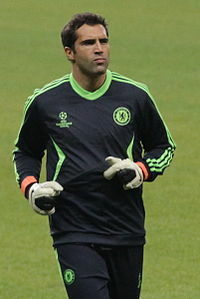 Hilario was signed by the 'Special One' in 2006 as a backup for Cech and Cudicini. If you follow the Premier League, you'd surely remember the match of Chelsea against Reading, which led to a tragic head injury to Petr Cech (damn you, Stephen Hunt, it nearly cost Cech his life), replaced by Carlo Cudicini, who was knocked unconscious to be carried off the pitch and John Terry finishing off the last few minutes as the goalkeeper. 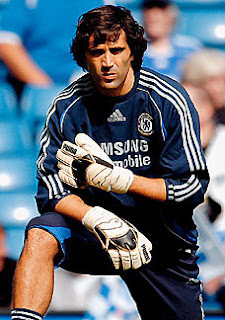 This enabled Hilario to make his debut against the mighty Barcelona and kept a clean sheet in a 1-0 win! In the run that followed, he made a string of superb performances until Cech's comeback. Mourinho even remarked that at that moment that he was playing as one best in the world and he wouldn't trade him for any other keeper! Hilario had to wait two long years to get the chance to play in an important match again. It was against Liverpool in September 2009 (in the previous match against Wigan, Cech was red carded). Chelsea won the match 2-0, Frenchmen Anelka and Malouda finding the net, but ask any Liverpool supporter, Hilario was the reason Chelsea triumphed. Considering the fact that this was his first professional match in about a year, the man of the match award was well deserved! The next time Hilario was called into action was during the Champions League match against Inter at the San Siro, when Cech just collapsed and he did not let anything go past him in the remaining half hour (Chelsea were trailing 1-2). However, Hilario did concede 4 goals against a determined City side which 10-men Chelsea eventually lost, their first at Stamford Bridge in 2010... It was a time when he was criticized and ridiculed for making those costly errors! Getting injured shortly afterwards, it was the end of his contribution for that season. In today's match against West Brom, after a ligament injury to Cech in training, Hilario certainly did NOT let anybody down. Although one went past him, he did make a few sharp saves, particularly towards the end of the match to ensure Chelsea secured the three points. Lampard once said, "Hilario has never let us down at all. He has been brilliant every time he has come in, whether it is for one game or a run of them". Considering Cech is out for at least 4 weeks, chances are he'll miss the all important match at Old Trafford and if Hilario errs in the games to come, I am sure along with him, I will be ridiculed as well! However, I believe that in spite of the fact that he has an OVR (overall skill) of just 74 in FIFA 11 (Cech is 84, so judge it yourself) & getting no younger at 35, this may be his last change to prove that he is a great goalkeeper!